In my ever growing pursuit to make the protein numbers up in my daily marco’s, I’m always swapping things, adding things and dropping things to make it all work. I have been having a Micellar and Iso/Hydro Whey mixture just before bed for ages to add a slow trickle of protein to feed the muscles while I sleep. I mix Optimum Nutrition Gold Standard Casein with either Optimum Nutrition Platinum Hydro Whey or Gold Standard Isolate Whey which were my go to products, but the results aren’t amazing. I have tried Extreme Milk Chocolate and Double Rich Chocolate and various others along with Chocolate Supreme Casein and the flavours as stand alone products are good, but when mixed they are not quite meshing together. Think of it like mixing Heinz Beans with supermarket own, they won’t quite mix, its the same idea with the proteins. I decided I needed a properly blended version with the same flavours adding to both by machine. 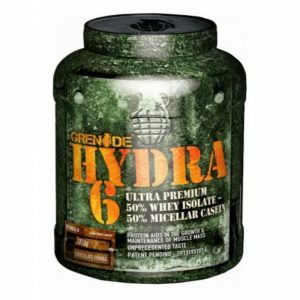 I opted first up to try Grenade Hydra-6, its a 50/50 mixture of Micellar Casein Protein and Isolate Whey Protein. I were a little surprised by the taste, it takes like, you know how you get chocolate cookies which are pale creamy in colour, and you get cookies which are dark chocolate coloured, they taste more like the darker colour cookies. I’m not talking about like Oreo cookies taste, but maybe that colour, its definitely a chocolate chip cookies taste. You can taste a few pops of different chocolates which are very nicely blended. Its a little thicker than just Hydro Whey or Isolate Whey due to the casein, which is thicker and grittier normally, but the Whey smooths it out and makes a nice shake. The casein I think is a darker chocolate taste. Its really smooth without being blancmange like, some I have tried end up almost like a blancmangey-porridge and stodgey. One of the points I really wanted to point it, I mix my shakes up in advance, and often they separate, and look lucky. The Grenade Hydra-6 doesn’t separate, least not in the 6-8 hours between my mixing and drinking. This means you could make up 2-4pt in a milk bottle and keep it in the fridge for a 24-36 hours to save having to wash your shaker constantly. I bought this one from Amazon, and when buying from Amazon, I only buy directly from Amazon mostly because you’re dealing fully with Amazon and their A-Z Promise is rock solid. I however still always check authenticity and the date printed on products I buy. Not that the dates are the be-all-and-end-all with protein powders. At a recently body building show, I were talking to a rep from a huge multi-national protein company and he were saying as long the powder is kept dry, sealed and stored at a constant temp away from sunlight it should be good for a year over expiry easy. Either way I always check the plastic seal, Grenade, Optimum Nutrition (the 2 products here) both both a printed/branded plastic tamper-proof seal on the neck. This increases the seal but is also the first step to ensuring its not been tampered with or counterfeit. Next, once you remove the seal (in ON’s case) or break the seal (in Grenades case) and unscrew the lid, you come across a hermetic sealed cardboard lid sealed to the bottle which ensures freshness and a further guarantee against having been tampered with or counterfeit. Both the Plastic Seal and the Paper Lid are part of the authenticity, fake products virtually never have these touches, be sure to check. 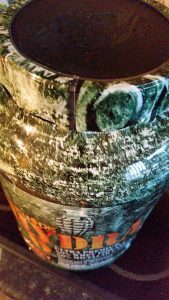 You will also notice the lid is also embossed or relief printed with the companies logo or name, and the print is crisp and clear.